Christmas Ornaments Made in USA - 2011 Official White House Theodore Roosevelt Ornament - A Christmas Ornament Co. The Official 2011 White House Christmas Ornament honors the administration of Theodore Roosevelt, the twenty-sixth President of the United States. Roosevelt took office on September 14, 1901, upon the death of President William McKinley, who had been shot by an assassin eight days earlier. Sworn in at the age of 42, Theodore Roosevelt was the youngest president in the nation's history. He brought vigor and power to the office as he led Congress and the American public toward progressive reforms and a place on the world stage. In one of his earliest acts as President, he issued an executive order establishing "The White House" as the official name of the presidential residence previously referred to formally as either the "President's House" of the "Executive Mansion." The 2011 ornament reflects the excitement that President Roosevelt, his wife Edith, and their lively young family brought to life at the White House. There had been no children living in the White House in the years since the departure of President Grover Cleveland and his family in March 1897. The front face of the ornament is a color illustration derived from a political cartoon drawn by William A Rogers in 1901. Capturing the anticipation associated with the family's first White House Christmas, a jolly Santa Claus crosses the snow covered North Lawn carrying a large bag of toys over his shoulder and announces, "I hear that there are some kids in the White House this year." 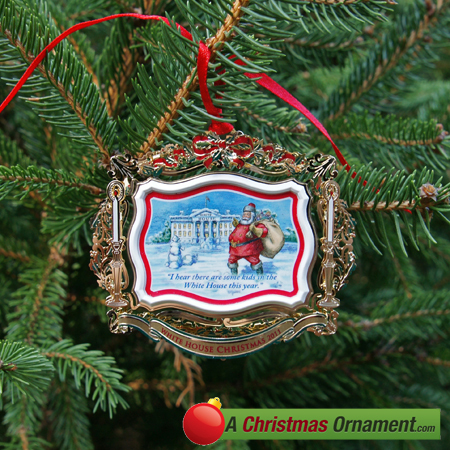 The reverse side of the 2011 White House Christmas ornament features a second color image inspired by a period illustration. It captures the moment in 1903 when young Archie (the second youngest of Roosevelt's children) reveals to his family a Christmas tree he had hidden in a seamstress's closet in the White House.